Does a day go by that you don’t get asked for a donation of some kind? To drop some coins in a box on a retail counter? To sign up to run a 5K? To pin an awareness ribbon to your lapel? To add $1 to your grocery bill? We’d probably all agree that the organizations asking us for help are doing important work. But is their work important TO YOU? There’s a reason why we ask people to go on mission trips—because when we see poverty, injustice, and pain up close and personal we want to get involved. We’re more willing to commit future resources–including our money–into ensuring the problems we experienced firsthand don’t remain problems forever. When Forever We asks you to donate towards our mission, we’re not just asking you to purchase a product in our store. We are asking you to engage in an experience that will literally change two lives. We begin with an invitation to join us in a frank conversation about childhood cancer. Everybody knows somebody who has been touched by this awful disease. But who wants to talk about that? By the same rationale, who wants to talk about poverty? We believe that talking about the things that scare us diminishes the power those horrible things have over us. Together, we have the ability to design solutions that make a difference. Bad things don’t have to stay bad. When the day ended, we realized something magical had happened: We cared about our new friends. Isn’t it true that the more we care, the more willing we are to step into the mess? We are willing to do more and give more. We wanted to know if it was possible to change the face of the generosity culture in America. Could we create an experience that encouraged donors to consider the children who inspired the charity in the first place? Kids helping kids is not a new idea! They’re curious and already want to help. Put another bow on the mailbox? Add another t-shirt in our drawer? Or are we going to do something brand new and exciting? Patient confidentiality protocol prevents us from simply showing up at oncology units across the country and ferreting out new friends. In fact, when I’m in the hospital myself, I’m grateful for confidentiality. Thankfully, there’s still one place in America where privacy is sacred. However, I also know that connection is a fundamental need of the human condition. I keep photos of the girls we met two years ago on my desk to this day. As I work, I’m reminded that they experienced something most of us never will. Our connection with those first two girls created lasting friendships that have influenced every relationship since. Forever We truly cares about the kids who play with our toys. We want them (and you) to experience the authentic joy that comes from purposeful play. 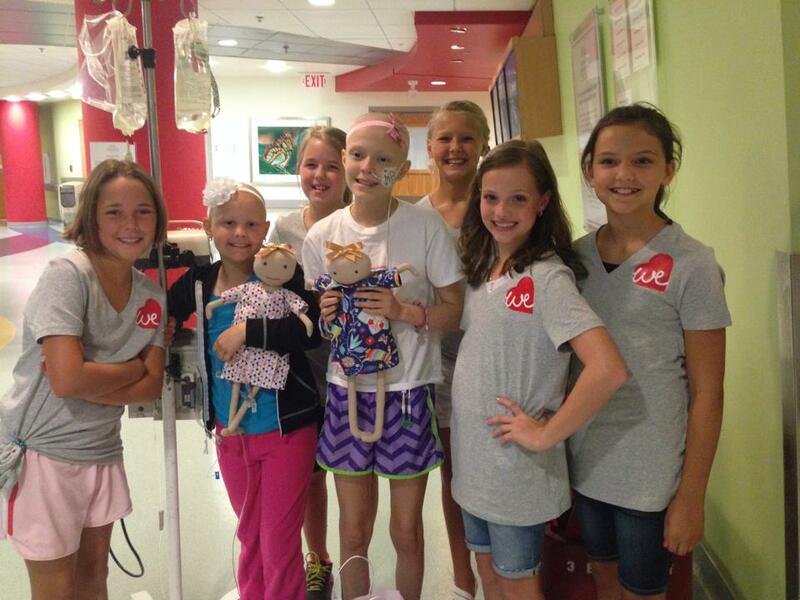 When you purchase a Forever We doll for a child in need, you get to be a part of that child’s story. You’re helping them tell their story. It’s a story you can share, as well.